For the third Stanley Cup playoffs in a row, the Washington Capitals and Pittsburgh Penguins will be meeting in the second round, with the past two series seeing Pittsburgh come out on top, going on to win back-to-back Stanley Cups. Also for the third year in a row, Caps goalie Braden Holtby and Pens goalie Matt Murray will be the guys between the pipes for their respective teams. 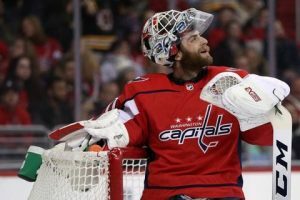 Of the veteran Holtby and the young, already two-time Cup champion Murray, which goaltender gives their team the best chance to win and advance to the Eastern Conference Finals? Looking at the 2017-18 regular season, both Braden Holtby and Matt Murray had relatively subpar years, based on past performance and current expectations. The former Vezina Trophy-winning Holtby struggled down the stretch this season, finishing with a total of 54 GP, going 34-16-4, with a 2.99 GAA and .907 SV%. He fell out of favor to backup Philipp Grubauer, who started Games 1 and 2 for the Capitals in their first-round series against the Columbus Blue Jackets. After starting 0-2, Washington turned to Braden Holtby to save the series, and he won 4 straight games to take it 4-2. Holtby turned it on in the series, going 4-1 with one game in relief of Grubauer, posting a 1.92 GAA and .932 SV%. Holtby is 33-31 in his career in the playoffs, with an astounding 1.99 GAA and .932 SV%, the second-best save percentage in playoff history among goalies, behind only Tim Thomas. Like Holtby, the Penguins’ Matt Murray also struggled in the regular season, posting the worst numbers of his short career. In 49 GP and 45 GS, Murray went 27-16-3, with a 2.92 GAA and .907 SV%, along with a single shutout. Also like Holtby, he turned it on in the first round against the Philadelphia Flyers, going 4-2, with a 2.20 GAA and .911 SV%, plus 2 shutouts in just 6 games. 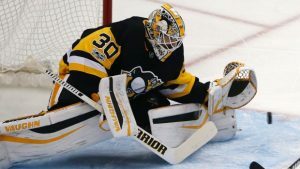 Without Marc-Andre Fleury to back him up this year, the onus is all on Matt Murray to carry the Penguins deep into the playoffs, going through the Washington Capitals first. 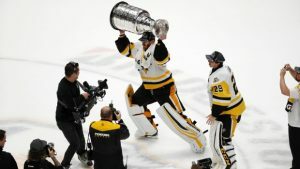 The 28-year old Braden Holtby has yet to advance past the second round in his career with the Caps, while Murray, at just 23, has already won a pair of Stanley Cup championships. However, that doesn’t necessarily mean that Murray is the better goaltender. With that being said, meeting for the third time in as many years, which one of the two goalies is better right now, and is best positioned to lead their team past the other’s? Let’s look at Holtby first. At 28, he is just a year or two before the age range wherein goalies usually hit their prime. For a goalie who has so consistently performed at such an elite level, one can assume that getting close to his prime would help elevate his game now. And, discounting the regular season and focusing strictly on his first-round performance, that appears to be the case. In the 4 games he started, Holtby looked as good and as sharp as ever, making his case again for leading the Caps on a run this year. In contrast, Matt Murray is just 23-years old. Usually, goalies don’t even break into the league until their late 20s, around 25 or 26 on average. So, is Murray a special case of being ahead of his years, and does he have the ability to continue playing at the level he has, or will the pressure and fatigue of this year’s playoffs get to him, and will he succumb to the performance of the grizzled Holtby on the other end of the ice? The case could be made that Murray has proved himself by now, and shouldn’t be doubted because of his age. Others would say that, like the rest of the Penguins, this might be the year that they lose out to the Capitals, simply due to the fatigue of two long playoff runs. Looking at the playing style of both goalies, Holtby, who is 6’2″ and over 200 lbs., plays a solid fundamental game, relying on positional saves and not taking himself out of the play. Murray, a 6’4″ lanky goaltender, sometimes strays from that method and is at times much more athletic than his sound play would hint at. All things considered, each goalie plays exactly how they should to hold the opponent’s offense at bay. That is why these teams are so evenly matched: they’re both built to play against each other. As are Braden Holtby and Matt Murray. As for who gives their team the best chance to win in this playoff series, I believe that is Braden Holtby. To so convincingly respond to doubters and crtics of his regular season play as to come into a series down 0-2 and win 4 straight games in astounding fashion proves that he is still the elite goaltender the league sees him as. I believe this is the year that Holtby has the Pens number, and this is the year Washington makes it past the Pittsburgh Penguins to advance to the Eastern Conference Final.